Understanding color theory and composition can help you learn more about how to design a painting. For a novice painter, learning how to design a painting can seem like an intimidating task. 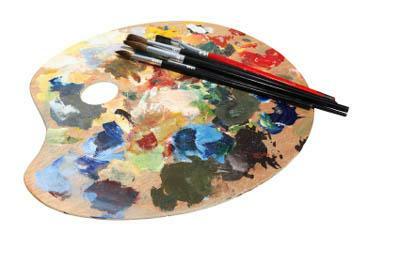 However, understanding color theory and composition can make it easier to create memorable artwork. Color is a powerful design element that can be used to set a mood or make a statement within your painting. Colors can be playful, whimsical, tranquil, elegant, or sophisticated. Whether you work in watercolors, acrylics, or oils, understanding the basics of color theory is an important component of knowing how to design a painting. Color theory is based around the idea that all colors are formed by mixing various amounts of three primary colors: red, yellow, and blue. Colors that are made lighter by adding white are called tints, colors made darker by adding black are called shades, and colors made by adding gray to the mixture are known as tones. Since colors can be classified as either warm or cool, learning how to combine colors effectively is a crucial skill for any artist. The term composition refers to the arrangement of elements within a painting, drawing, photograph, or other artistic work. Whether you're painting landscapes, nudes, or abstract designs, understanding basic composition rules will help you improve your skills as an artist.Composition includes the area of the painting used for the illustration, the values used within the painting, the perspective used to give the illusion of depth, and the line or direction the viewer's eye follows when observing the painting. The rule of thirds is one of the most basic composition guidelines to be used when learning how to design a painting. This principle says that the subject of a painting should be placed near the intersection of the lines that would divide the image into three equal columns and rows. This creates more energy, tension, and visual interest than simply placing the main object of interest within the center of the painting. The Basics of Composition: Rules or No Rules? If you are painting a still life, use a digital camera to take photos of several possible compositions. Seeing all of the photos together will make it easier to determine which design is best. If your painting seems off balance, look at it from several different angles. In many cases, seeing your painting upside down will help you isolate relevant design problems. Get in the habit of noticing the color combinations in fashion, interior design, and advertising. Many of these ideas can be translated to your own paintings. While artists are taught that it's important to be original, there's nothing wrong with drawing on the work of others to inspire your own creativity. Many of today's most prominent painters began their work by mimicking the style of their predecessors.